Something NEW is coming. Brace yourself! 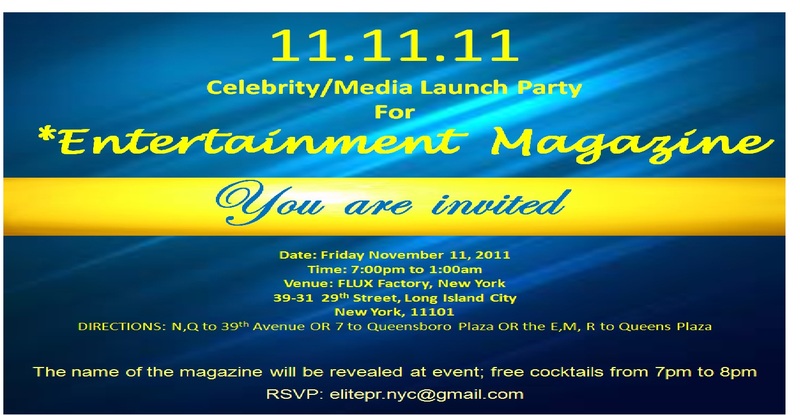 Please join us for the launch of New York’s newest entertainment magazine. The launch party promises to be a great evening for networking and celebrating fashion, style, music and everything entertainment-related. No one knows the name of the magazine, as the name will be revealed at the launch event. Be among the first to know – be a part of history! Music, light fare, and libations will be provided. View the Facebook event page here. RSVP to elitepr.nyc@gmail.com. The event is organized by current Flux Artist-in-Residence Lawman Lynch, a grant recipient of the Edward and Salley Van Lier Fund of The New York Community Trust. Air Rights: a series of artist-made flags curated by artist and Fluxer, Christina Freeman. The first flag is Revised U.S. Flag #4 (Francisco Franklin), designed by Francisco Franklin, in collaboration with artist Maya Grace Misra, combines elements from the United States flag and the flag of his home country, Panamá.